THE CEO OF FACEBOOK, Mark Zuckerberg, criticised Donald Trump and others for spreading fear and “distancing people they label as others”. Speaking at Facebook’s developer conference F8, Zuckerberg said he noticed “people and nations turning inward” and how some were using this fear as a way to block immigrants and refugees. “Against this idea of a connected world and global community. I hear fearful voices for building walls and distancing people they label as others,” he said. It takes courage to choose hope over fear, to say we can build something and make it better than ever before. You have to be optimistic to think you can change the world and people will always call you naive but it’s this hope and this optimism that is behind every important step forward. While Zuckerberg didn’t mention him by name, it was clear that he was talking about Donald Trump by referencing his speech about building a wall on the Mexican border. Tying into this was Zuckerberg’s plan for Facebook to play a significant role over the next ten years, as a way of connecting people and giving everyone a voice. “Instead of building walls, we can help people build bridges. Instead of dividing people, we can bring people together,” he said “We can do it one connection at a time, one innovation at a time. Day after day after day”. Everything we’re doing is building technology that brings people together… the path forward is to connect people. 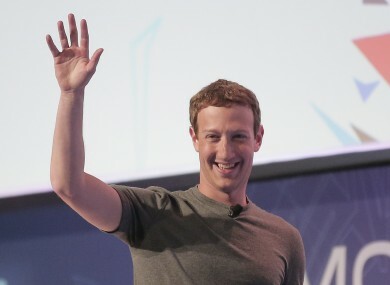 Over the 30 minute keynote, Zuckerberg touched upon a number of different products. Virtual reality and artificial intelligence were some of the topics touched upon (and he even had a ‘one for everyone in the audience’ moment by giving audience members a Gear VR and Samsung Galaxy S6 for free). Talking about its messaging services, Zuckerberg mentioned that between it and WhatsApp, more than 60 billion messages are sent on both platforms every day. As part of that, he launched Messenger platform, a service which would allow businesses to create their own chatbots. The approach is similar to other companies like Microsoft which announced its own chatbots earlier this month, giving a more streamlined way for people to order goods or submit requests. Other features it’s rolling out is letting developers build products around Facebook Live, the service’s streaming platform. While streaming can only be done through the Facebook app itself, the move will allow other companies to stream from other services like drones and broadcast through Facebook. Email “Mark Zuckerberg had a dig at Trump for his talk of "building walls"”. Feedback on “Mark Zuckerberg had a dig at Trump for his talk of "building walls"”.